From the makers of Zombie Wonderland, Etolis: Arena is a survival shooter app in the same swarm style. Run through environments, blast enemies, and survive long enough to prepare for the next wave. 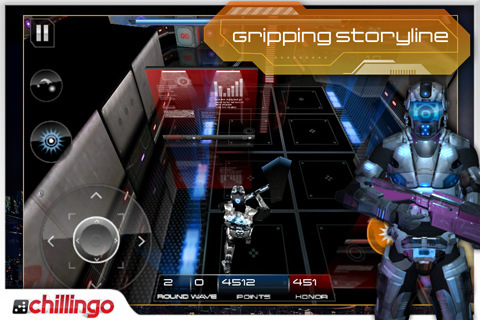 Etolis Arena, released by Chillingo Ltd, is available as an universal iPhone and iPad app for $1.99. Welcome to Etolis. I don’t know what that word actually means, but if it has anything to do with “Great Game”, then I’d believe it. Etolis: Arena is bombastic, intense, and difficult. 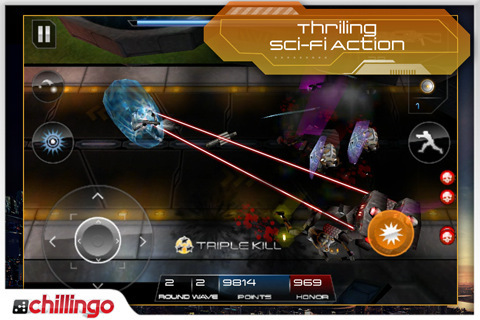 Take up a shotgun, machine gun, or some explosive mines and fight against waves of machines. Swarming bug-like bots, whipping female aliens, and shielded soldiers, the variety of enemies the game pushes against you can be punishing. Graphically, the entire package is great. High-tech cybernetic or dusty alien planet, the style is consistent and really works in terms of level design. Weapons are nicely designed for balancing, some textures are so crisp it’s surprising. This is a dark, but pretty game. The best part is you can toggle on effects like the dynamic lighting to help stop lagging and performance issues. Combat style is the standard top-down dual-stick shooter. The difference is that this app does in fact go a bit above the average. Controls are tight and easy to use. Aiming and grenade use is easy; the pseudo-analog stick control works great. The clean interface helps when there are nearly 20 enemies surrounding you. It feels just right. The gameplay forces you to watch your ammo and sprinting ability so don’t expect to feel like a one-man army. Etolis: Arena is fun because of its refined gameplay. It really feels like they play tested to make sure the controls work responsively and that the action is paced well. I usually died because I made a bad decision. Didn’t set up the land mine on time or wasted too much ammo on the wall rather than the enemy… yeah, I deserved that… I really enjoyed Etolis. I didn’t have any lag issues whatsoever with my iPhone 3GS and the end result is a game app well worth the money. In other words, if you like shooters, get this one. With more updates, it could turn out to be one of the top shooters out there. AppSafari review of Etolis: Arena was written by Joseph Ho on March 24th, 2011 and categorized under App Store, Arcade, Featured, Fun, Games, iPad apps, Scrolling Shooter, Universal. Page viewed 3957 times, 3 so far today. Need help on using these apps? Please read the Help Page.